November 9th is a day that stands out on the calendar, roughly and abruptly torn between joy and sadness. On November 9, 1989, in what seemed at the time to be an almost surreal turn of events, the crossing points between East and West Berlin, tightly controlled since August 13, 1961 were opened to all East Germans who wished to cross them. Before the night of November 9, 1989 dissolved into the sunrise of November 10, people were dancing with joy atop the Berlin Wall. 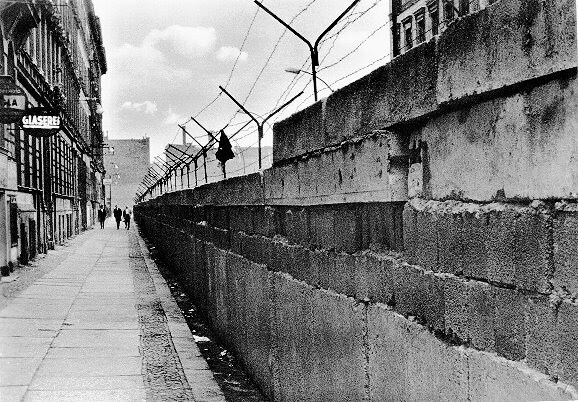 As many as 200 people had been killed trying to cross the Berlin Wall during its grim 28 year history. So desperate were people to escape from communist East Germany that even the sewer system connecting East and West Berlin had to be secured by the communist authorities to stop its use as an escape route. To those who lived in the shadow of the Berlin Wall, its ultimate fall was an impossible dream come true. November 9 is also another anniversary in German history that is shrouded in sadness. On November 9, 1938, there was a nationally coordinated pogrom that unfolded all across Germany. Ostensibly a "spontaneous" reaction to the assassination of German diplomat Ernst vom Rath in Paris by a Polish Jew, it was orchestrated, aided and abetted by the Nazi government. During that national pogrom on November 9, 1938, synagogues, Jewish businesses and homes were plundered and destroyed from one end of Germany to the other. Jews were beaten, murdered and sent off to concentration camps. Any hope that German Jews had of a future in Germany died on that day. 21 years after the fall of the Berlin Wall and 72 years after Kristallnacht, their respectively joyous and tragic memories continue to echo and to resonate. From the Balkans to Rwanda, from the Congo to Sudan, the desire to demonize and kill those whose language, faith or race differ from the dominant majority is a sickness that continues to blight the globe. North Korea remains one giant prison, its borders fortified to protect it not from invaders but from the escape of its own citizens. With the Berlin Wall but a memory, the fortified borders of North Korea remain a monument to the failure of communism to capture the hearts and minds of those forced to live under it. The Berlin Wall is no more. Its original construction of cinder blocks and concrete grew malignantly into a complex of free fire zones and motion detectors over its 28 year history before it collapsed splendidly on the night of November 9 and 10, 1989. The frightening echoes of shattering glass, the smell of buildings put to the torch and angry mobs running through the streets back in the grim time of Kristallnacht back in 1938. have long since faded into collective memory. The desire to protect a failed political system with barbed wire and guard towers remains an affliction of our time. The desire to obliterate those who do not resemble in language, creed or skin color us is a sickness that has broken out with sickening regularity around the globe. Rwanda, the Congo, Darfur and the Balkans are among the portions of the globe that continue to remind us of the human capacity for hatred and intolerance. November 9, a day forever torn between joy and sadness, is a time to reflect upon how far the human race has yet to travel before it reaches its true potential.